A few days ago this story came out about a Japanese cyclist who was trying to ride around the world, only to have his bike stolen in China. 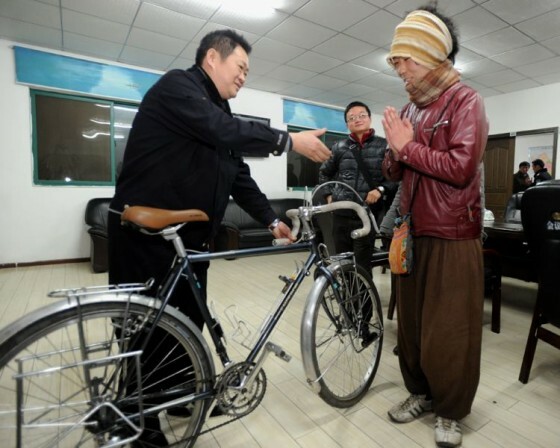 When he described his plight on the web, netizens and Wuhan police snapped into action and his 13,000 yuan bike was recovered days later. Predictably, many Chinese weren’t so pleased with this happy ending. People’s Daily is absolutely right that authorities should extend much more effort for common Chinese. Since the media usually isn’t free to expose police ineptitude or corruption, many forces are lazy do-nothing outfits that won’t raise an eyebrow unless there’s something in it for them. But the anger over this particular story has gotten a bit out of hand. First of all, the way the story unfolded was very tongue-in-cheek. Bored netizens found their cheeky cause of the day and managed to deliver on their largely satirical mission – which is what made it newsworthy. Also, this wasn’t just an everyday bike theft. This was a foreign traveler who lost his means of transportation an ocean away from home. I often travel in this way and dread the day when my bike gets stolen in the middle of nowhere. You can’t just go to the local bike shop and pick up a new one. In Nanjing it took me weeks to find and soup up a bike capable of long-distance travel. And the logistics of just returning home would be a nightmare. There’s awkward-to-carry gear, unexpected costs, and who knows how many legs of travel would be required. If I heard a foreign cycler was travelling through Kansas City and had his bike stolen, I’d expect police to devote more attention to the case than a standard local theft. He’s alone and stranded in a strange land. The bike’s importance is much more than its cash value. Still, there are plenty of Chinese in much more desperate situations that go completely ignored. But I don’t think the case of the Japanese man paints a very realistic picture of foreign vs. local treatment. In Nanjing I once had a 2,000 yuan electric scooter stolen. When I reported it to the police they filled out the standard paperwork and went about ignoring it just like they did with the Chinese. Yes, foreigners in desperate need of help from authorities probably are more likely to get it in most situations; but that’s not really unique to China. Police are typical human beings. A person in trouble who’s alone and can’t speak the language or navigate the cultural complexities will usually elicit more sympathy than a local with family, friends, and a grasp on how things are done. But are foreigners given special treatment in general by Chinese because of an inferiority complex? Yeah, I must have had 4-5 bikes stolen in Nanjing during my ~2 years there, each within at most six months of buying it. At first I went through the rigmarole of having it registered with the police and getting one of those license-plates (something which is, or at least was, supposed to be compulsory). After my bike was stolen before I could even register it, I stopped bothering. The weirdest one was my last – the thief stole the pedals and nothing else. Bike thieves in NJ were just off the hook in ’05 – is it still that way? My British friend once saw a thief carrying his bike away awkwardly with the lock still on one wheel. There was a campus security guard nearby sitting in his little golf cart patrol vehicle so my friend pleaded with him to go after the thief before he got away. He just sat there and pretended he didn’t understand the situation. Foreigners do get special treatment, for better or worse. I don’t think that an inferiority complex plays a major role here. Foreigners are viewed as guests in this context. That said, there is a tendency in China to turn every single event into something exemplary, just as every campaign is meant to be exemplary. If anything, the debate afterwards suggests that there is an inferiority complex. Anyway – what worries me more is that we have this trend in European countries (and apparently in the U.S., too). Petty stuff is inflated into another big piece of evidence for the doom of the occident, its superiority, its racism, etc. It seems to reflect an almost collective refusal to think something through. I had my near-new bike stolen when it was chained to the railings of the Sino-Japanese Hospital in Beijing. I was in the emergency department at the time having a cardiac problem investigated. They should bring back the death penalty for bicycle theft. $2000 bikes look nothing like chinese bikes, probably made it a lot easier to locate. I stopped with the bikes in china, they just get stolen too often. I do take a skateboard with me for the long walks. I guess resentment at apparent special treatment may be part of this, but just as much of a problem is the tokenism of the whole thing. The cops don’t give a damn about stolen bikes, bike theft is ubiquitous in China – but this story tries to make out that it’s not such a problem and that the police can beat it. Maybe it’s due to the values in Chinese society about properly treating guests and acting as generous hosts?